Sar Bagh is the royal crematorium of the princely state of Bundi. Hada princes were a clan of the Chauhans and settled in the Bundi region around the 12th century. There are 66 cenotaphs and the entire complex is situated opposite Jait Sagar. Some of the cenotaphs have beautifully carved statues. 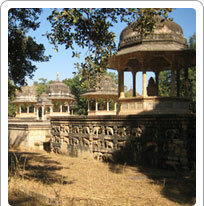 Tourists visit Bundi frequently to see the Sar Bagh in particular.